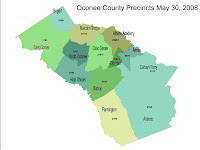 At its August 5 meeting, the incumbent Oconee County Board of Commissioners dealt with an old issue that the new Board of Commissioners almost certainly will deal with repeatedly after it takes office in January. The Board turned down a rezone and a special use request that would have allowed more development in the southern part of the county. Don Norris, tossed out by voters at the July 15 Republican primary, supported the rezone. Jim Luke, whose margin of victory over his challenger on July 15 was 207 votes, admitted he was wavering before voting against the rezone. Commissioner Margaret Hale missed the meeting, but Chuck Horton, who handily pushed back a challenge on July 15 by pro-growth advocate Mike Maxey, was rock solid in his opposition to both requests, saying he wanted to protect the southern part of the county. Travis Marshall had asked to rezone 51 acres on State Route 15 from agricultural use to residential. Joy Clark wanted to convert a single-family residence on 6 acres on Colham Ferry Road from a single family residence to a group personal care home. The full meeting is viewable online. Exactly what Oconee County voters were trying to tell the Commissioners to do on issues such as this in their vote on July 15 is impossible to know exactly. What is clear is that most people didn’t vote. Chairman Melvin Davis, who won by only 100 votes, has seized on that fact, saying this might mean that people were happy with his policies. All one can say with certainty about the 63 percent of the registered voters who did not show up on July 15 is that they were willing to let those who did vote decide the outcome. And those voters did provide some hints about their intentions. An analysis of the precinct-level election outcomes suggests that voting was structured in part on the evaluation of incumbents, Davis, Norris and Luke as an incumbent team. Davis and Luke survived, though by small margins. The analysis also suggests that the vote by Davis, Norris and Luke for an ordinance allowing for the sale of beer and wine in the county wasn’t so important. The precincts that gave support to Davis were also the ones that gave support to Luke and Norris, and those precincts that supported one of their opponents supported the others. The precincts that voted most strongly against the alcohol initiative on the ballot in 2002, however, were no more likely to be those that voted against Davis, Norris and Luke than the other precincts. Horton and Hale, who criticized Davis openly in the run-up to the July 15 election, enjoyed support that cut across precincts in ways that differed from the patterns of support and opposition for Davis, Luke and Norris and the patterns of the 2002 alcohol vote. Precinct analysis is a far from perfect way of understanding individual voting decisions. In the language of social science, inferring individual-level behavior based on aggregate data can lead to an "ecological falacy." Precincts are geographic divisions of the county, however, and homogeneity or similarity within a precinct is almost certainly greater than it is across all 13 of them. For this reason, treating a precinct as an identifiable entity makes sense. Similarities in outcomes across the precincts can illustrate patterns that can provide insights into t he election outcome. I treated each of those 13 precincts, shown on this labeled precinct map, as units. I also treated the absentee ballots and ballots cast before the election as a cluster, giving me 14 units for analysis. Click on the image to make it larger, or go to my companion website for another version and for all the charts below. Chart 1 plots the proportion of votes for Sarah Bell, who challenged Melvin Davis for the Chairman position, and the proportion of votes for Johnny Pritchett, who ran against Luke, across the 13 precincts and the absentee ballot cluster. A proportion is the same as a percentage, except it is divided by 100. The chart shows that Farmington and Antioch precincts supported both Bell and Pritchett, and Malcolm Bridge and Athens Academy opposed both. Farmington and Antioch are the two most southern and least developed parts of the county, and Malcolm Bridge and Athens Academy are two of the most urbanized precincts. Pritchett, who is mayor of Bishop, did much better in the Bishop precinct than did Bell. Chart 2 plots out the votes for Sarah Bell and John Daniell, who defeated Don Norris. Farmington and Antioch supported Bell and Daniell, and Athens Academy and Malcolm Bridge opposed both. Bishop gave more support to Daniell than to Bell. One way to summarize these relationships is with a correlation coefficient, which ranges from +1 to 0 and then -1, with +1 meaning a strong positive match of the data and -1 a strong negative match of the data. Coefficients of 0 mean there is no match, and values fall along the continuum. In Chart 3, by way of illustration, I show the vote for Chairman Davis, as a proportion of the total vote, compared with the vote for Sarah Bell, the challenger. Because the vote for one is the opposite of the vote for the other (in proportions), the relationship is shown as negative. In those precincts that voted strongly for Davis proportionately, the vote for Bell was, of necessity, small. The data shown in this chart produce a correlation coefficient of -1. I have simplified some things here statistically, such as the way I’m treating the gaps between the data points along the lines and the starting points of the lines. The goal is to reduce the data to make it easy to see patterns if they exist. Chart 3 also shows that Bell’s support was not limited to the southern part of the county. Both Annex and City Hall, where she got a majority of the votes, are precincts based in Watkinsville. The correlation coefficient for the relationship between the vote for Bell and Pritchett in Chart 1 is .83, and the coefficient for the relationship between the vote for Bell and the vote for Daniell in Chart 2 also is .83. In other words, these are nearly as strong–but in the opposite direction–as the relationship between the vote of Bell and Davis. The correlation between the vote for Bell and the vote for Hale is .64 (Chart 4), and the coefficient for the vote for Bell and Horton is only .25 (Chart 5). The coefficient for the votes for Bell and Esther Porter, Hale’s opponent, was -.64, and the correlation between the vote for Bell and Mike Maxey, Horton’s opponent, was -.25. Horton’s and Hale’s vote correlated .48, and the relationship is shown in Chart 6. Both won, but the did so in somewhat different ways. The county changed the configuration of its precincts between 2002, when voters turned down an initiative to allow the sale of liquor by the drink, and the 2008 primary. One precinct was eliminated, but five precincts (Antioch, Farmington, Bishop, Dark Corner, and Bogart) were unchanged. Another five (Annex/Watkinsville East, Colham Ferry/Flatrock, High Shoals, Athens Academy/Friendship, and City Hall/Watkinsville West) changed only slightly, though the names changed in four of the five precincts. I used the five unchanged and the five slightly changed precincts, plus the absentee and advance ballots, as 11 units to look at the vote patterns for the 2002 election and the July 15 primary. Chart 7 shows the plot for the Bell vote in 2008 and a vote against the 2002 liquor issue. The correlation coefficient is only .27. For the Pritchett vote, the correlation was .22. For Daniell, it was .32. For Hale, it was .06. For Horton, it actually was a -.49, meaning there was a slight tendency for the precincts that voted against the liquor initiative to vote for Horton. Horton and Hale voted against the beer and wine ordinance when it came before the BOC. In sum, knowing how a precinct voted in 2002 on the liquor initiative tells you little to nothing about how that precinct voted in 2008 in the race for the five BOC positions. Bell’s vote at the precinct level was correlated .64 with the vote of Ed Carson for coroner in the July 15 primary and .50 in the Aug. 5 runoff. Carson ended up winning in the runoff. Bell’s vote was correlated .82 at the precinct level with the vote for Ryan House on the Board of Education, but it basically was uncorrelated with the vote in any of the other BOE races. I also looked at the impact of political party affiliation on the July 15 BOC races. The July 15 BOC contest was within a Republican primary, but, in Georgia, we do not register by party, and we are able to ask for either the Republican or Democratic ballot at any given primary election. On July 15, with the local contests on the Republic side of the ballot, only 91 percent of the voters asked for the Republican ballot. In February, however, we had a very competitive presidential primary in both parties, and 66 percent of the people in the county asked for the Republic ballot and 34 percent asked for the Democratic ballot. The percentages varied across the 13 precincts, with 59 percent of the voters in City Hall precinct asking for the Republic ballot and 76 percent of those in North Oconee precinct asking for the Republican ballot. The proportion of voters asking for the Democratic or Republican ballot in the competitive February presidential primary was unpredictive of the vote across precincts on July 15 for any of the BOC candidates except Horton. Horton did better in those precincts with more Democrats, based on the February presidential primary vote, than he did in those with more Republicans. The coefficient, however, was only .65, meaning the relationship was not overly strong. In the school board race, all five of the successful candidates had their names listed first on the ballot, where candidates appeared alphabetically by last name. Chairman David Weeks ran unopposed, so his selection was unaffected by the order of listing. Political scientists have found evidence in a variety of races that some voters tend to pick the first name listed on a ballot. This suggests a certain carelessness or indifference on the part of voters to the election process. The evidence for an order effect in the July 15 voting, however, is not strong. Since the ballots were the same across all precincts, the vote in one precinct should be highly correlated with vote in another if order of listing was the key determinant of vote. The correlation coefficient for the vote of Mack Guest with Kim Argo, both listed first and running for Posts 2 and 3 respectively, was only .12. The correlation between the vote for Guest and for Michael Hunter, listed first for Post 4, was actually -.22, and the correlation between the vote for Guest and Tom Breedlove, listed first for Post 5, was -.25. Argo’s vote proportions by precinct correlated only .18 with those of Hunter. Hunter’s vote proportions correlated not at all (.00) with those of Breedlove. Guest was the only incumbent on the Board of Education ballot. The ballot identified incumbents for all of the races. Bell’s vote proportions correlated -.82 with the proportion of votes for Guest. For Pritchett, the correlation with the vote for Guest was -.80, and for Daniell, it was -.89. Daniell and Guest both won, but they got their support from different precincts in the county (Chart 8). If there is a message in the precinct data generally, it is of an anti-incumbent pattern of voting, though the only incumbent who lost was Don Norris. Davis explicitly argued he had managed growth well, and Norris has rarely voted against a rezone. In the campaign, Luke enjoyed the support of the development community. Horton and Hale, the two BOC incumbents who won by big margins, did not enjoy support of much of the development community. During the campaign, they argued for more caution in development of the county. The two votes at the BOC meeting on August 5 to protect the southern part of the county from development seemed to reflect the citizen concern with overdevelopment. Of all the candidates who were successful in the July 15 primary, only Board of Education candidate Breedlove has Democratic opposition in November. Breedlove and Rich Clark face off then for the Post 4 school board seat. Breedlove is a partner in Williams & Associates Land Planners, which represents developers in the county, and Clark is survey specialist at the Carl Vinson Institute of Government at the University of Georgia. Pretty incredible analysis for any election, never mind a local one. Nice work. Well done. There is a lot to digest here. The relation between Bell and House votes at the precinct level is puzzling -- maybe a spurious relationship or maybe they both touched a anti-incumbent or pro-outsider nerve. Overall, though, I think your case that attitudes about development were prominent is solid. On a small point, I think the .65 correlation coefficient representing the relationship between Horton votes and precincts with many Dems is pretty strong; this is, after all, social science, and I've seen many relationships put forth as truth with weaker coefficients. I think the biggest problem with your precinct analysis, apart from the ecological fallacy--which is worth risking in the absence of individual-level data, is the fact that 26 percent of the voters fall under absentee voting. This would not be a problem if you could be certain that these voters are proportionately from each precinct and that they have the same level of knowledge as primary day voters -- two assumptions that are hard to support. Thanks for the comments. These are very helpful. I think that Bell, Pritchett, Daniell and House all touched an anti-incumbent or pro-outsider nerve. The data are consistent with that. I can only speculate that the anti-incumbent sentiment was also against development as it has occurred during the incumbency of Melvin Davis, Jim Luke and Don Norris. I think Mack Guest was simply seen as an incumbent and lumped with the others. The ranges for the correlation coefficients are from -1 to +1. Whether .65 is strong or not is a matter of judgment. I certainly agree that it is not a trivial relationship. You are correct in saying that about a quarter of the voters cast their ballots outside of their precincts. I should have noted that. In fact, the absentee/provisional vote matches very closely the overall vote, meaning that there is evidence that the absentee/provisional vote is drawn from the whole county in a way that represents the whole county. The average absolute difference between the absentee/provisional vote and the overall vote in the July and August voting was 1.2 percentage points. In no race was the difference more than 2.6 percentage points. Given the match with the overall voters in terms of candidate choice, I think the best guess one could offer is that the absentee/provisional voters also represent the voters across the precincts in other ways. I’ve also uploaded three additional charts at http://lbbecker48.googlepages.com/Merged9-11.pdf that may be of interest to some readers. These charts plot out the votes for the school board races and show how little of a relationship exists between votes for the winning candidate–always listed first–as the voters moved down the ballot. These charts help support my argument that order on the ballot was not an overly strong factor in the races. None of these races was close, and I don’t think ballot order was the deciding factor in any of them.